For a man who liked being called "the" American, Mark Twain spent a surprising amount of time outside the continental United States. Biographer Roy Morris, Jr., focuses on the dozen years Twain spent overseas and on the popular travel books "The Innocents Abroad," "A Tramp Abroad," and "Following the Equator" he wrote about his adventures. Unintimidated by Old World sophistication and unafraid to travel to less developed parts of the globe, Twain encouraged American readers to follow him around the world at the dawn of mass tourism, when advances in transportation made leisure travel possible for an emerging middle class. In so doing, he helped lead Americans into the twentieth century and guided them toward more cosmopolitan views. 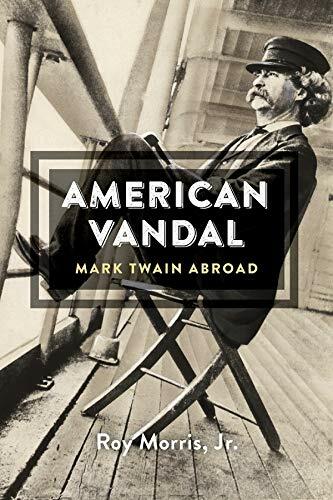 In his first book, "The Innocents Abroad" (1869), Twain introduced readers to the American Vandal, a brash, unapologetic visitor to foreign lands, unimpressed with the local ambiance but eager to appropriate any souvenir that could be carried off. He adopted this persona throughout his career, even after he grew into an international celebrity who dined with the German Kaiser, traded quips with the king of England, gossiped with the Austrian emperor, and negotiated with the president of Transvaal for the release of war prisoners. "American Vandal" presents an unfamiliar Twain: not the bred-in-the-bone Midwesterner we associate with Huck Finn and Tom Sawyer but a global citizen whose exposure to other peoples and places influenced his evolving positions on race, war, and imperialism, as both he and America emerged on the world stage." Morris effectively evokes both the personal and political realities behind Twain s fictions and semi-fictions to demonstrate how Twain himself debunked then-prevalent myths of travel and of national character. "American Vandal" gives readers a fresh view of Mark Twain while casting a revealing light on American identity. --James Leonard, editor of "The Mark Twain Journal""
Roy Morris, Jr., is the author of numerous books, including Lighting Out for the Territory: How Samuel Clemens Headed West and Became Mark Twain.